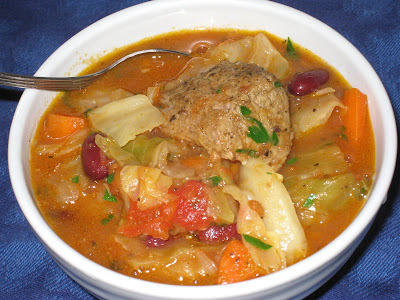 The title of this post should be Lamb and Cabbage Stew with Fresh Shell Beans, and it would have been if the Apple Market had not been out of lamb shoulder and I hadn't been forced to substitute pork shoulder, and if any store in my area carried fresh shell beans. Luckily, I happen to love pork shoulder so it was no real sacrifice to substitute the pork for the lamb. And kidney beans worked just fine in place of the freshly-shelled. Last week they had beautiful heads of cabbage on sale at Treasure Island for 29 cents a pound. I bought one, and then had to decide what I wanted to do with it. I had just pulled this recipe from Bon Appetit, and this is the perfect time of year for such a hearty stew. I don't have much to say about this stew, except that it is delicious. Marinating the meat overnight in the spices flavors it all the way through, and the cinnamon added a hint of warmth as it was simmering. There are a lot of ingredients, but it really isn't a lot of work. Most of the time is cooking time. While this isn't the least expensive meal I've made, at just about $2.50 a serving it's not exactly outrageous, and definitely worth the splurge every now and then. And as good as it was with the pork, I can't wait to try it with the lamb. Note: Start this dish a day ahead; the meat needs to marinate overnight. Toast coriander and caraway seeds over medium-high heat in a small skillet, until they are just turning color and are emitting a toasty aroma, about 3 minutes. Be careful not to burn them. Put them in a small bowl and let cool for a few minutes. Give them a fine grind in a spice mill (I use a coffee grinder) or a mortar and pestle. Place the spices in a large resealable plastic bag. Add the mint, salt, turmeric and crushed red pepper. Add 1 tablespoon of the oil and mix everything into a paste. Add the cubed lamb, seal the bag, and squish everything around until all of the meat has been coated with the paste. Place the bag on a plate and chill in the refrigerator for at least 8 hours, or overnight. Heat 2 tablespoons oil in a large pot over medium heat. Add the lamb mixture and the onions and saute until the meat is browned and the onions are translucent, 8 to 10 minutes. Add the tomatoes, garlic, cinnamon stick, and bay leaf. Bring the mixture to a simmer. Add carrots and the cabbage, and sprinkle with coarse salt and pepper. Add the water and 2 tablespoons of the lemon juice to the pot and stir everything together. Bring to a boil, Then reduce the heat to low, cover and simmer until the meat and cabbage are tender, stirring occasionally, for 1-1/2 to 1-3/4 hours. Remove cinnamon stick and bay leaf from stew. Add the beans and remaining tablespoon of lemon juice. Cook for an additional 5 minutes, until the beans are heated through and the flavors have blended. Check for seasoning and add salt and pepper if desired. Stir in the parsley and serve immediately.